How does a large state university support a pedagogy of lower student to instructor ratios in large class sizes? The University of Massachusetts Amherst, flagship of the state’s university system, boasts an enrollment of 28,000 students. Similar to many of its peer institutions, the chemistry department was plagued by antiquated facilities and large class sizes. Historically, introductory and advanced chemistry courses were taught in the Goessman Laboratory. The laboratory was arranged with 6-30’ long benches with four students per side for a total of forty eight students. Sessions involved one instructor and three teaching assistants. 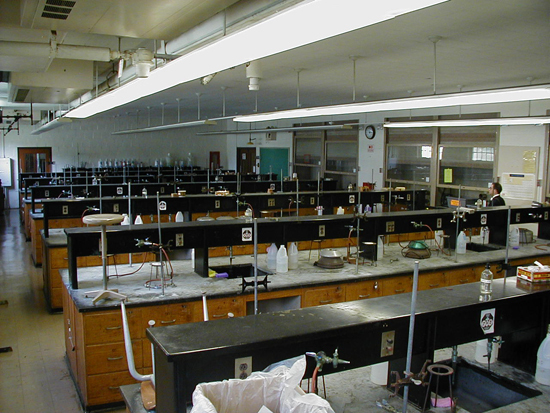 Six fume hoods were located on one side wall at the end of the benches. The opposite side wall was used for balances and other instrumentation. While this arrangement maximized the number of students, it did not facilitate lab instruction or teamwork. Circulation in the lab also was an issue as access to fume hoods frequently required crossing the lab which created potential chemical spill hazards. The architecture of the lab also did not promote smaller professor or teaching assistant ratios, which the department desired. When Payette planned the new Integrated Sciences Building, the university wanted to plan for sections of up to 160 students. In these sections, the University strove to preserve a ratio of 16 students to 1 teaching assistant. A particular challenge in this model is to allow observation of the entire group by the professor while still maintaining environments conducive to instruction in smaller groups. 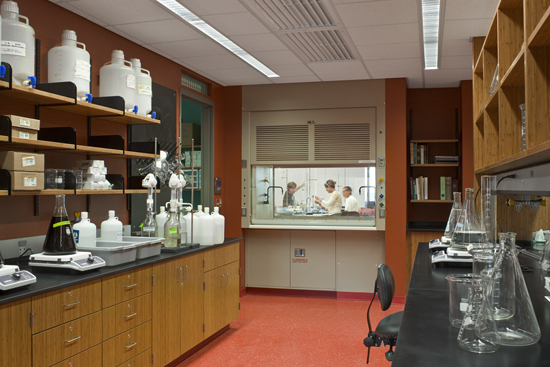 In the Integrated Sciences Building, the General/Intro Chemistry suite layout allows an instructor to rotate between modules (almost like a doctor doing rounds) without leaving the general lab space. The layout features five lab modules on each side of the building with support space in between. Grouping students in smaller modules provides a seminar-like environment typically found at smaller teaching universities or liberal arts colleges. 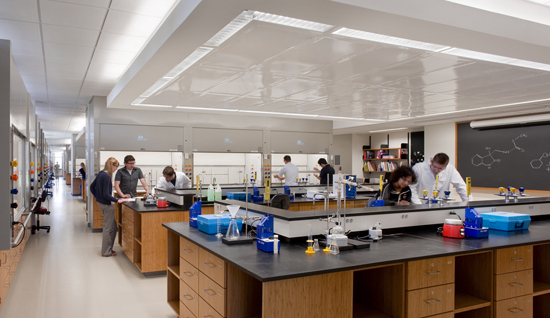 Each group of four students shares a fume hood which is immediately adjacent to the cluster. Each module has a marker board wall which promotes both pre-lab instruction and impromptu discussions between faculty/teaching assistants and students over the course of the lab sessions. “This is how a science building should be. I can teach without interrupting the lab next to me, because each section is partitioned … just enough. And the space allows for students to focus.” – Shaynah Browne, Teaching Assistant, Chemistry Department, University of Massachusetts Amherst. By utilizing all of the floor area, the solution nets a remarkably efficient net:gross ratio. The clustering of the labs allows the labs to be serviced from a support core. The proximity allows each module to be supplied chemicals, glassware and for waste to be removed without crossing public paths of circulation. The team used a similar approach for Organic Chemistry, where a 85-seat classroom serves the pre-lab teaching needs and the labs are set up for the tailored instructional needs of the group while preserving the 16:1 (student:TA) ratio. There are 80 students in each section of Organic Chemistry. The laboratory component of the course is taught in a suite of five 16-student modules aligned along one side of the building. 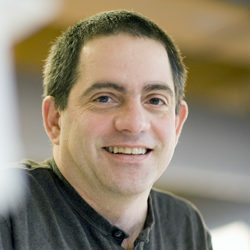 Each is open to the adjacent module to facilitate the professor’s movement between. There are ten hoods in each module, eight to serve pairs of students and one each for chemical supply and waste collection. Nearly all of the experiments are conducted inside the fume hoods which are arranged around three sides of the perimeter. The center of the space functions as a note taking area in a U-shaped bench that performs like a seminar space. Lab instrumentations related to the program are located within this bench area. In addition to meeting the pedagogical goals of the university, the arrangement supports lab safety and energy efficiency. A large supply plenum is located in the center of the room, over the u-shaped bench. This provides low velocity laminar flow directly to the high-efficiency fume hoods arranged around the perimeter of the room. The low velocities, decrease turbulence at the hoods and result in lower system noise, facilitating discussion in the labs. Thanks for providing this informative article on UMASS Amherst and student-teacher ratios. It’s great to hear that the new space has lent itself to become a better learning environment.